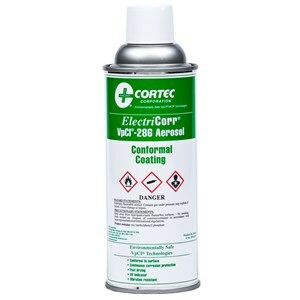 ElectriCorr VpCI-286 Conformal coating was designed to ensure long-life performance of new and repaired electronic assemblies, especially those which are under adverse corrosion conditions such as high heat and atmospheric humidity. This non-conductive coating is a technological breakthrough in a new generation of circuit board conformal coatings. This non-conductive coating combines outstanding moisture intrusion prevention as well as superior corrosion resistance with Cortec’s patented Vapor phase Corrosion Inhibitor technology. 12 oz. aerosol spray. Cortec’s conformal coating protects printed circuit assemblies against contamination, by providing a sealed microenvironment around the circuit board and its components. This is most important where there are tighter component packaging densities and increased performance requirements. The VpCI coating forms a barrier against microscopic dendrite growth, termination and surface corrosion, moisture, fungus, dust and other environmental contaminants. ElectriCorr VpCI-286 also enhances circuit reliability by prohibiting dangerous conditions such as leakage from high impedance circuits with high component density topography. ElectriCorr VpCI-286 is a single component formulation that is easier to use than two component coatings eliminating special metering and mixing equipment. Also, ElectriCorr VpCI-286 contains an optical identifier visible with UV light, assuring rapid and effective visual confirmation of proper coating on surfaces.